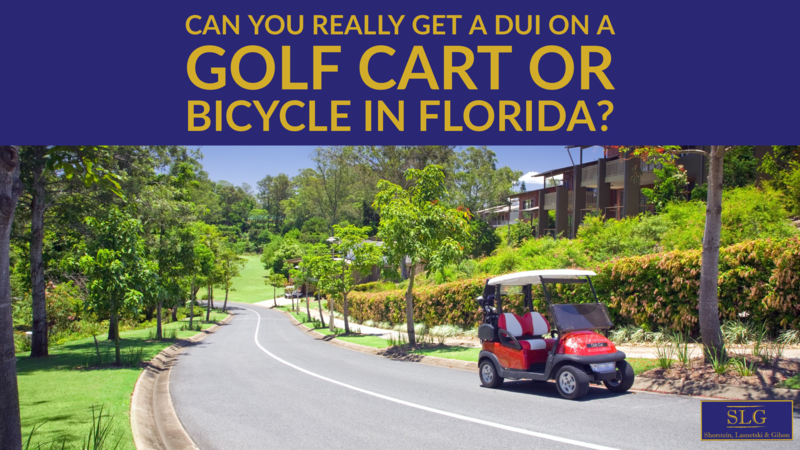 Can You Really Get A DUI On A Golf Cart Or Bicycle In Florida? 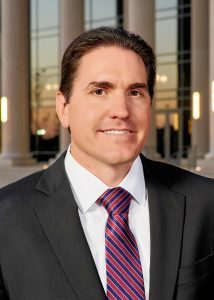 One of the more common cocktail party questions criminal defense attorneys get asked is whether you can get a DUI while driving a golf cart, or even riding a bicycle. In Florida, the answer is yes. You can be arrested, charged, convicted and sentenced for DUI (Driving Under the Influence) for operating a golf cart or a bicycle while under the influence of alcoholic beverages or controlled substances to the extent that your normal faculties are impaired. This will become more and more of an issue with the creation and expansion of golf cart communities, like our very own Nocatee in Ponte Vedra, Florida, where you will see scores of golf carts traveling between residences and local bars and restaurants on a daily basis. Believe it or not, yes, you can. Florida’s DUI statute, Fla. Stat. §316.193, prohibits a person from driving, or being in actual physical control of, a vehicle while under the influence of drugs or alcohol or while having a .08 BAC level or more. Notice that the word “motor” is not present before the word “vehicle.” The legislature specifically wanted the DUI statute to apply to more vehicles than just motor vehicles. 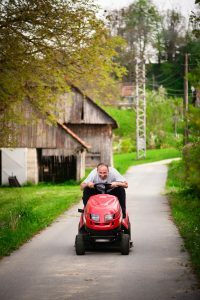 So, what is the definition of a vehicle for purposes of the DUI statute? Can I lose my license if I get a DUI on a Golf Cart? Yes. This has also been a point of litigation in Florida courts. Although, Fla. Stat. §322.04(e) specifically exempts people driving golf carts from being required to obtain a driver’s license, as long as the golf cart doesn’t exceed 20 miles per hour and you are in compliance with Fla. Stat. §316.212 (Operation of golf carts on certain roadways), you will still have your driver’s license suspended if you get a DUI on a golf cart. Why? Fla. Stat. §322.04(e) deals with who is exempt from needing a driver’s license, not with how your driver’s license can be suspended. Fla. Stat. §316.193, Florida’s DUI statute, which includes all “vehicles” lays out the penalties for a DUI and one of those penalties is a mandatory driver’s license suspension. Do people actually get arrested for DUI on golf carts and bicycles? While law enforcement is more concerned with DUIs that occur in motor vehicles because of the impact alcohol related car crashes has had on so many lives, there is nothing to stop them from making an arrest at any time for golf cart DUIs, bicycle DUIs or for any other type of DUI. As a practical matter, it is how law enforcement comes into contact with you when you are driving a motor vehicle versus a golf cart that explains why there are so many motor vehicle DUI arrests and so few golf cart DUI arrests. Most motor vehicle DUI arrests occur when law enforcement stops a driver for a traffic infraction or has a minor traffic accident. Golf carts and bicycles are rarely stopped for traffic infractions or accidents. But if they are and there is evidence of drinking alcohol, it is likely an officer will initiate a DUI investigation. We see golf cart or bicycle DUI arrests most often when there is either an accident, a citizen complaint, or some traffic infraction. For example, if a person is impaired and making a scene at a public place, someone is likely to call the police. When the police respond, if they see the person driving or in actual physical control of a golf cart and the person appears to have been drinking, the law enforcement officer is probably going to conduct a DUI investigation, which consists of the officer’s observations, the person’s statements or admissions, field sobriety tests, witness statements and more, followed by an arrest and then a breathalyzer after arrest. Similarly, if an officer notices a golf cart operating driving in an unauthorized area and stops the golf cart, the officer may conduct a DUI investigation if he smells an odor of alcoholic beverage on the person’s breath. Most of these arrests are the result of the person getting the attention of law enforcement because of their inebriated behavior or because of some other traffic or law violation.